AFC Fylde strengthened their position in the National League play-off zone with Tuesday’s victory at Hartlepool but the match left manager Dave Challinor with very mixed feelings. 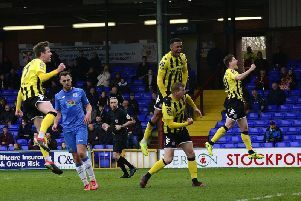 His side have recovered from successive defeats with two 2-1 victories in four days, and Challinor’s latest signing Arthur Gnahoua scored the winner on his debut in the north-east, but the Coasters boss admitted to feeling “disappointed” after the midweek victory which lifted his side two places to fourth. Challinor’s concern that his side made life difficult for themselves against hosts who have now lost six successive games. Despite plenty of chances, it took Fylde almost until half-time to break the deadlock with Danny Rowe’s 14th league goal of the season. It was only in the 74th minute that the Coasters gave themselves the breathing space of a second goal, then they had to endure a nervy final few minutes after Scott Noble pulled one back for Pools from the penalty spot. And Challinor felt that anxious finale should have been avoided. He said: “I’m delighted we won but I’m a little bit disappointed if I’m honest. “We were praised when we showed a ruthless streak at Maidenhead (a 6-0 away win a month ago) when they went down to 10 men, but we didn’t show that tonight. We should have been out of sight. There’s loads of positives toobut the bigger picture is that it’s easier to learn when you’ve won. On another day Rowe could have had a hat-ful – the top scorer saw one effort cleared off the line and was thwarted one-on-one by home keeper Scott Loach. In the end, Hartlepool had opportunities to equalise late on, which would have made Challinor’s mood worse. With no midweek games before Christmas, Challinor can focus on four Saturday games, three of them at home starting with Saturday’s visit of Sutton United. The London club are just one point outside the play-offs but needed to come from two down for a point away to bottom club Braintree pm Tiesdau. Tuesday’s win saw the Coasters climb two places, leapfrogging Harrogate and a Solihull Moors side who entertain Blackpool in the FA Cup second round tomorrow.